The Australian Council for Educational Research (ACER) was commissioned by the Standing Council on School Education and Early Childhood (SCSEEC) to produce this report. This report has been made available under the terms of the Creative Commons licence (CC BY 3.0 AU). 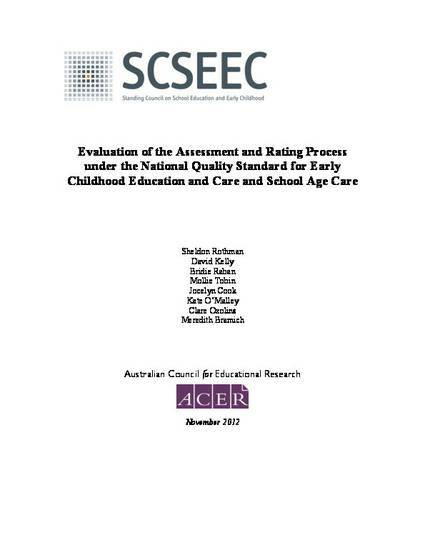 This evaluation of the assessment and rating process for early childhood education and care and school age care services had as its focus the validity and reliability of the process. In particular, do the items reviewed with the Assessment and Rating Instrument provide consistent and replicable measures? Would the judgements made by one authorised officer be made by other authorised officers reviewing the same service? Does the process—including use of the Instrument—allow distinctions between rating levels? The evaluation was undertaken by the Australian Council for Educational Research (ACER), which analysed assessment and rating data from both draft and final reports; managed the online surveys of services and authorised officers; conducted focus groups with services and authorised officers; and had discussions with regulatory authority staff. Focus group sessions were conducted in each capital city, with participants from outside the metropolitan area participating in person or by telephone.